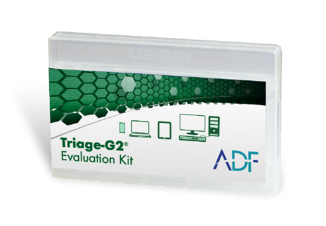 Triage-G2® is DoD approved for intelligence to support expeditionary special operators which provide tactical and operational level forensic technical exploitation capabilities to forward deployed forces. Make ADF Triage G2 the baseline lab kit to support your site exploitation needs. Triage-G2® is designed specifically for non-technical military operators with a simple 2-step process to rapidly scan, extract, and analyze critical intelligence from computers and digital devices. ADF software is deployed in biometric identity management kits for reconnaissance on a ruggedized, portable USB key and does not require dedicated computer hardware.